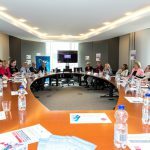 25 April 2018 marked the first European Alpha-1 Awareness Day dedicated to raising further understanding about this rare genetic condition. 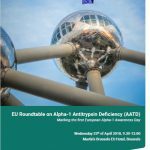 A roundtable discussion hosted by Alpha-1 Global, took place at the European Parliament in Brussels, where Alpha-1 leaders from seven countries presented their conditions of access to care for Alpha patients and made policy requests to the MEPs who were present. 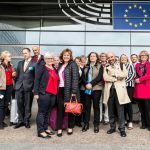 The Day was marked by six Members of the European Parliament, committing to improving the situation of Alpha-1 Antitrypsin Deficiency (AATD) in their respective countries. 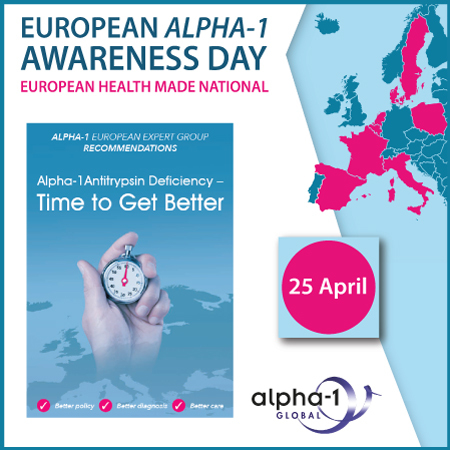 EU Alpha-1 support and awareness is growing among policymakers as a result of the European Alpha-1 Awareness Day. AATD is most common in individuals of Northern European and Iberian descent. Despite its prevalence in Europe, patients and healthcare providers continue to be poorly informed about the disorder, and an overwhelming number of individuals are therefore not correctly diagnosed as Alpha-1 patients. Rare diseases are an often neglected issue because of their relatively low prevalence. The burden of such conditions is not about numbers, but about an individual’s life which can be significantly impacted by delayed diagnosis and limited access to treatment. 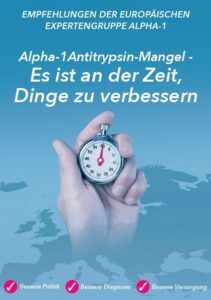 Alpha-1 Antitrypsin Deficiency is one of those rare conditions that can significantly impair health and be life-threatening. Without proper treatment and care patients can have a decreased life expectancy and suffer from severe shortness of breath, immobility, recurrent hospital admissions and may eventually require lung transplantation. In addition to causing serious lung disease in adults, AATD can also cause life threatening liver damage in adults and children that may also require liver transplantation and more rarely a disfiguring skin condition. Alpha-1 currently has no cure, however, there are treatments developed for better disease management. One of the most progressive treatments for Alpha-1 lung and skin affected patients is plasma derived therapy to restore the normal level of AAT, which slows down progression of lung damage and heals the skin condition panniculitis. 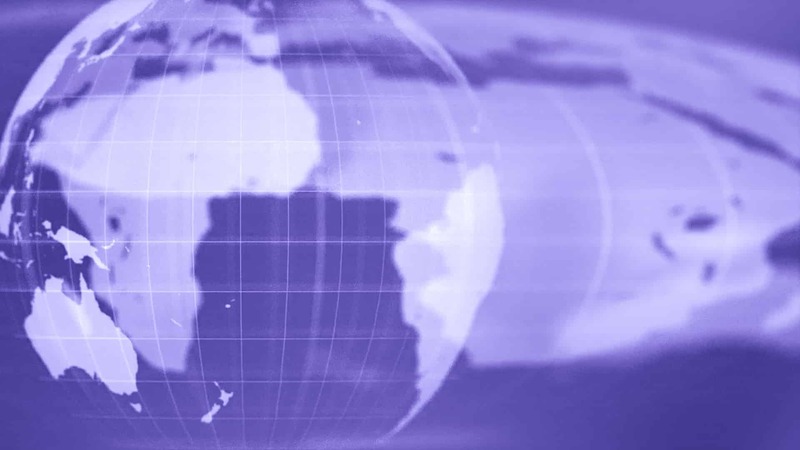 National policies on Alpha-1 diagnosis, treatment and care vary across Europe, as each country has its own healthcare system and policy for rare diseases. Despite promising results and cost-effectiveness of augmentation therapy, there are only a few countries that reimburse the treatment. This inequality is evident for example in the Netherlands, where augmentation therapy is reimbursed only for a selected group of AATD patients. In Belgium the reimbursement stopped several years ago, leaving those Alpha-1 patients diagnosed after June 2010 without treatment. In Poland, Alpha-1 patients do not have access to augmentation therapy and face limitations to correct diagnosis and care. Without timely diagnosis and appropriate treatment, the life of many patients is at risk. Currently, AATD is a largely under-recognized, and thus, underdiagnosed condition requiring immediate action by the Member States’ governments to improve the lives of affected individuals. All Member States should develop an Alpha-1 diagnosis programme in their rare disease plan. The European Commission should develop a project to generate minimum credentials for Alpha-1 centres of excellence. National paying agencies should develop reimbursement decisions by distinguishing Alpha-1 patients who are either those with rapid or non-declining lung function. National governments should ensure that legislation does not deter individuals from genetic testing for rare diseases by ensuring that non-symptomatic patients do not have higher insurance premiums. HCPs should consider a diagnosis of Alpha-1 in patients with COPD, emphysema, adult onset bronchial asthma, bronchiectasis, unexplained liver disease, panniculitis, unexpected vasculitis and any patients with a family history of Alpha-1. 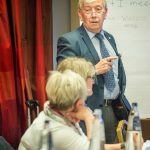 Centres of excellence should work through networks such as the European Reference Networks to share expertise, refer patients and educate healthcare professionals across Europe. If you have unexplained symptoms of lung, liver or skin disease, ask your doctor to be tested for Alpha 1. Alpha-1 patients should adjust their lifestyles to reduce the chance of the onset, or aggravation of lung, liver or skin disease. Alpha-1 patients and carers should seek support from the patient and/or support groups. 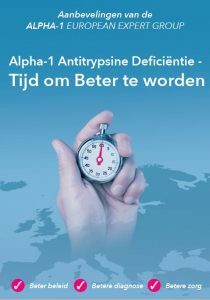 This Alpha-1 European Expert Group Recommendations document highlights how the European community can improve care for patients, and calls on all citizens to be more aware of the need to diagnose, treat and care for Alpha-1 patients. The Alpha-1 European Expert Group Recommendations were launched at the European Parliament on 22 March. 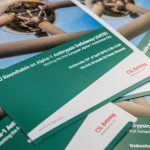 Read the full launch report here. 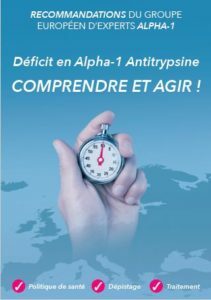 To view and download the Alpha-1 European Expert Group Recommendations click here. 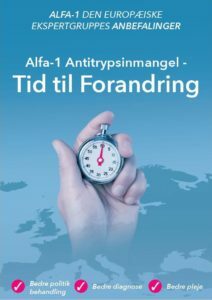 TRANSLATIONS: The Alpha-1 European Expert Group Recommendations has been made available in Danish, Dutch, English, French, German, Italian, Portuguese, Romanian, Spanish and Swedish. An instructional webinar has been created on how to more effectively use this document as you advocate in your country. View the video below.